A special feature of Notre Dame High School is its NJROTC program. NJROTC (Naval Junior Reserve Officers Training Corps) is sponsored by the U.S. Navy and is a secondary school program for students. Students may participate in the program between 9th and 12th grades. They are not recruited or obligated to enter the military; it is a citizenship and leadership development program. NJROTC teaches self-discipline, leadership, respect and self-determination skills to assist students in successfully accomplishing life's goals. Notre Dame's NJROTC program has been very successful over the years; earning Distinguished Unit citations several years in a row. Our unit provides a variety of activities including Drill Teams, Color Guard, Rifle Team, Academic Team and Air Rifle Shooting Team. Our NJROTC drill teams have been garnered a host of trophies at meets in which they participate in annually including the Mexico Academy Drill Meet, the Proctor Drill Meet, the North Rockland Drill Meet, and the East High School Drill Meet. NJROTC stresses the importance of community service. Notre Dame's NJROTC unit is no different; we participate in weekly nursing home visits and in important causes around the community including the annual Veteran's Day Parade, Mayor's ball, and other service projects. The cadets' community service teaches and reinforces new skills such as how to assume responsibility, and exposes the students to the needs of the outside world. Notre Dame's NJROTC program is very rewarding. Upon completion of the program, students can be justifiably proud of their accomplishments. It is a program of determination, responsibility, and hard work that will not go unnoticed. You will stand a little taller having worked a little harder. 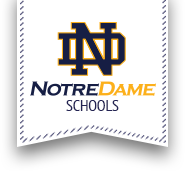 To learn more about the Notre Dame NJROTC program, please view the student-run website.